January give-away: Happy Birthday to me! I love birthdays – every year is a bonus, a blessing, a challenge. I have made a promise to myself to celebrate each birthday with great vigour! As such, I’ve enjoyed my wonderful presents, I’m going out for lunch with my boys, I’m going to have a few barbecues with friends and I’m going to eat cake. Lots of cake. With ice-cream. I didn’t want you guys to miss out on the fun, so I thought I’d mark the day with a give-away. This month, you have a chance to win a copy of one of the books that I’m reading at the moment; Makeda, by Prue Sobers. “He wanted to applaud her for her cleverness. With peerless skill at court, she had seduced his hidebound courtiers and made them laugh. Now single-handedly, with a feather’s tip, she has soothed his counsellors and brought the rowdy meeting to a seamless head. With Makeda, you’ll take an Ethiopian adventure, travelling with the beautiful and spirited Makeda, the Queen of Sheba. It has romance, intrigue, and royalty – what more could you possibly want? …and tell us what you’re planning to do for your birthday this year. 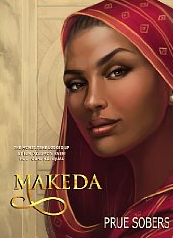 The winner of this month’s competition (selected at random) will receive a free copy of Makeda. Entries close Monday, 30 January 2011. The winner will have four days to claim their prize, or a redraw will be held. For my birthday this year I’m going to plan a feast. I don’t mind cooking (and still hate the clean up!) but I also know that its the only way anything remotely special will happen….. Pathetic really. DH needs to make sure he’s at least in the country as he tends to forget birthdays are special! This year, I turn 35. My kids have decided I should have a dress up party like I had for my 21st – come as your favourite fictional character. They can’t wait until I turn 40! !